Fishing for salmon in the Homer lagoon located on the Homer Spit in Alaska. 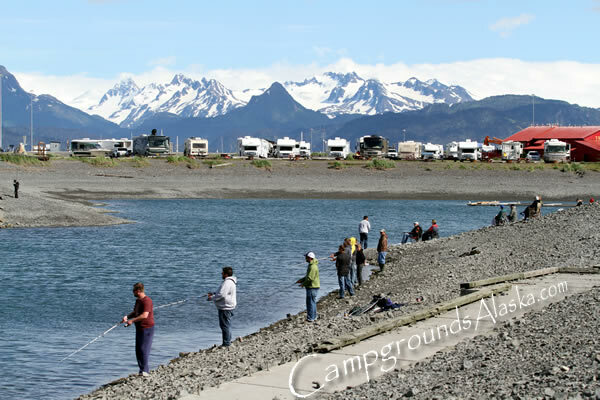 Salmon fishing at the Homer Fishing Lagoon and the great camping at the Homer Fishing Lagoon Campground. The fishing lagoon was designed with wheelchair access ramps that met current Americans with Disabilities Act (ADA) standards to allow access to the fishery in "The Fishing Hole" at any tide. The Nick Dudiak Fishing Lagoon or more commonly referred to as the Homer Spit Fishing Hole just might be the most popular salmon fishing location in Homer Alaska. 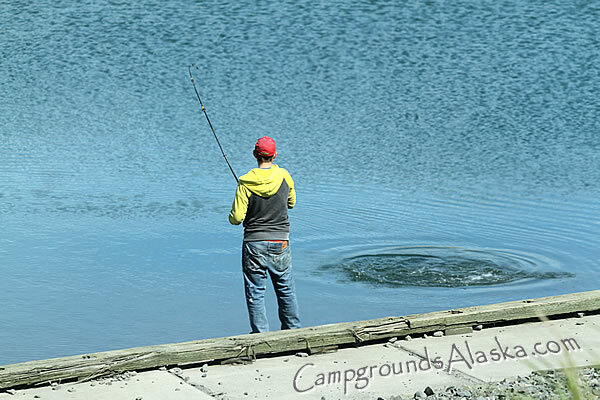 The Homer Spit Fishing Hole is extremely popular with residents and visitors alike. The salmon returning to the lagoon come from hatchery stock. The fishery is maintained to provide an affordable and easily accessed place for just about anyone to come and enjoy the sport of salmon fishing in Alaska. The construction of a handicapped accessible platform and ramp makes for easy and enjoyable fishing for everyone that wishes to come on down and wet a line. There are two main salmon species that are stocked in the lagoon. the first is the large and tasty King salmon, (Chinook salmon), returning around mid May and into early to mid July. 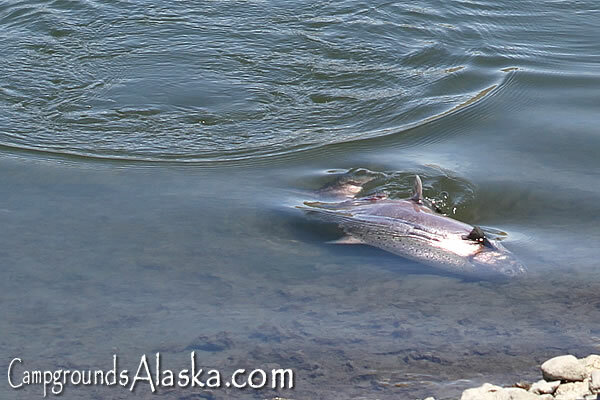 Those mighty King salmon are directly followed by an early run of silver salmon starting in mid July, just as the King salmon run comes to an end. The silvers continue into early August before a late run begins to arrive a week or so later in mid August continuing into mid September. On the western end of the fishing lagoon is a campground complete with fish cleaning tables, carcass waste bens, restroom facilities, and a small picnic area provided for your use. There is plenty of area for sitting or standing as you enjoy watching all of the excitement too. In 1984, the State of Alaska began stocking young juvenile king salmon in the unused lagoon located at the far end of the Homer Spit to establish an easily accessible, bank-fishing fishery for sport fishermen to enjoy. in the late 1980's the state began a silver salmon stocking program to further enhance the fishing opportunities at the now popular Homer Fishing Hole. Today, stocking of both king and silver salmon has continued as the popularity of this fishing location has continued to grow.